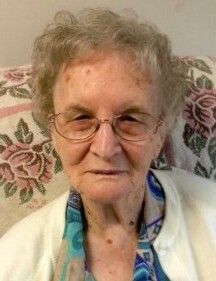 Erline Elizabeth Hall, 89, of Hope Mills passed away on Sunday, November 25, 2018. She was born to Sarah Marie Devane Roberts and Roy Roberts in White Oak, NC. Erline is preceded in death by her parents; three brothers, Jim, Billy, and Jack Roberts; and two husbands, Alton Huffman and Eustace Hall. She is survived by two sons, Bobby Huffman and Danny Huffman of Hope Mills; sister, Emma Jean Bullard and husband, Vernon of Beaver Dam; step-brother, Carl Huggins, two step-daughters, Helen Hall and husband, Johnnie, and Linda Hall; four grandchildren, Bryan Huffman of Wake Forest, Steve Huffman and wife, Tonya of Salisbury, Amanda McBride and husband, Mike of Hope Mills, Jason Huffman and wife, Danielle of Broadway; eight grandchildren, Hailey Huffman, Emma Grace and Jack Huffman, Blake Bradford, Brayden and Allyssa McBride, Preston and Cameron Huffman. Funeral services will be on Thursday, November 29, 2018 at 1:00 pm at Jernigan-Warren Chapel. Burial will follow in Lafayette Memorial Park. The family will receive friends at the funeral home on Wednesday, November 28, 2018 from 6:00 pm until 8:00 pm.